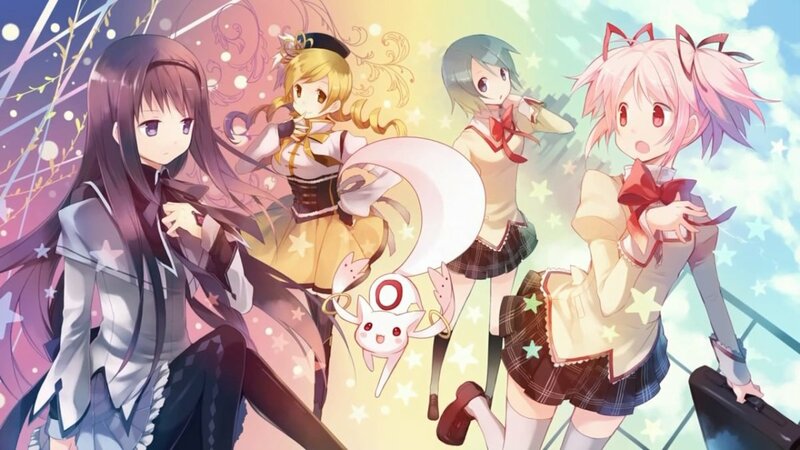 When it comes to anime series in which philosophy is explored or referenced, Puella Magi Madoka Magica is probably one of the most interesting and entertaining. Like Hamlet, it's a story where the protagonist struggles with a crucial decision throughout (there's even a nod to this in the first witch in episode 1 being called Gertrud, a reference to the Hamlet character Gertrude perhaps?). In both cases, many unforeseen tragic consequences result from their indecision. 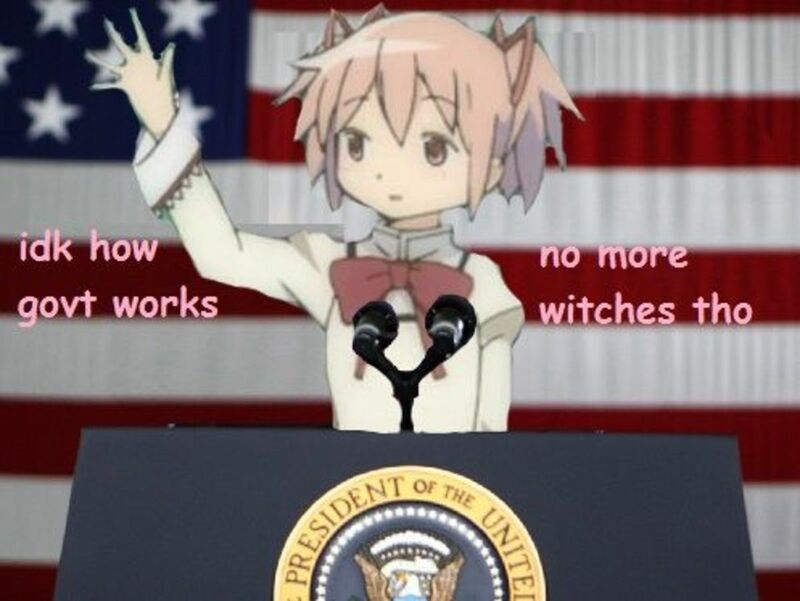 Madoka's decision is about whether to make a contract with Kyubey, a white alien ferret-like creature who can talk to the girls telepathically, and become a magical girl and fight evil in exchange for a single wish. Throughout the show, instead of making her decision directly, she learns from others who make the contract. Various girls she encounters have different ideas about what being a magical girl means. Mami is motivated by a desire to do good for the sake of good, while Kyoko acts only with regard to her own self-interest. 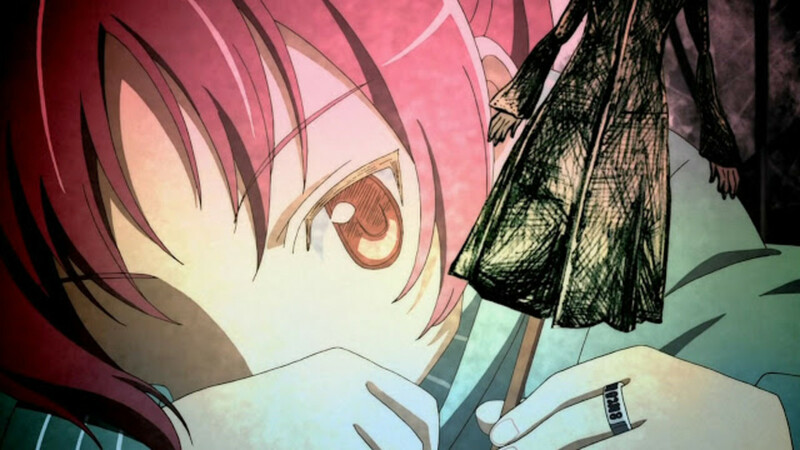 When her friend Sayaka makes the contract, Madoka witnesses bad consequences of doing so. Throughout all of this, Homura, a mysterious magical girl, is practically begging Madoka not to make the contract and trying to stop her from doing so. 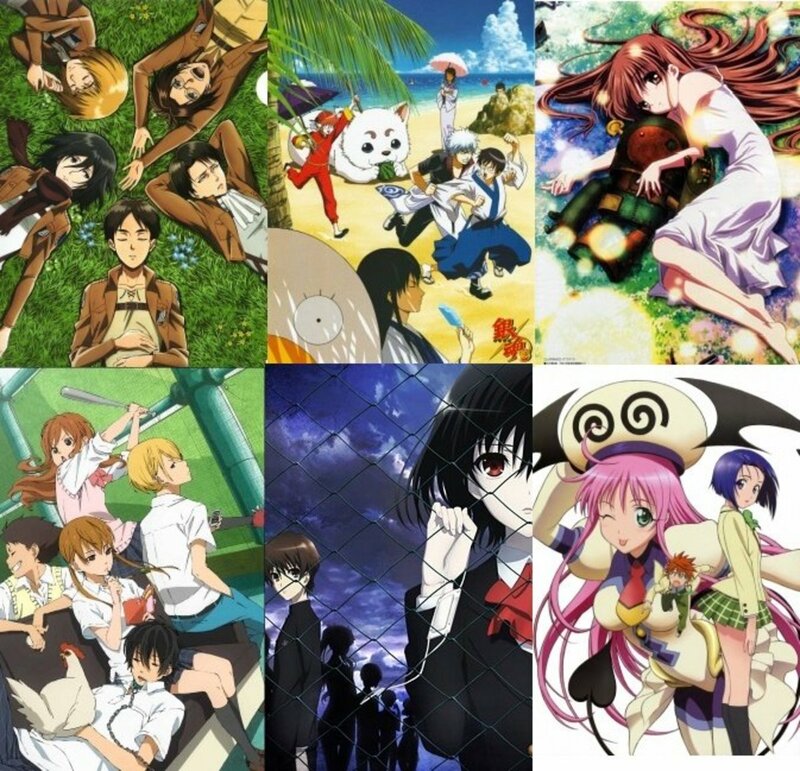 Basically, each character operates under their own ideology, their own set of principles about how the world should work and what constitutes moral and immoral actions. All of them have different goals, values, and outlooks, reflecting different schools of thought in the real world. 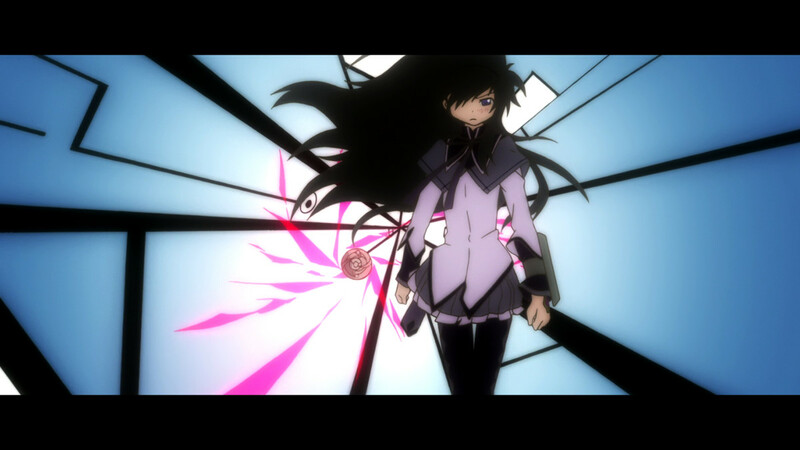 So here are 13 ideas from philosophy I've connected with various characters and concepts in Puella Magi Madoka Magica (and for this article, I'm talking mainly about the anime, not Rebellion so much). In the nature vs. nurture debate, the concept of the tabula rasa or blank slate falls on the nurture side. Basically, the idea is that we're not born with any innate knowledge that we had before we were born, and are shaped by experiences. Philosophers associated with this concept include Aristotle, Thomas Aquinas, and Locke. With Locke, his idea that humans were a "blank slate" at birth meant that they ought to have the political freedoms necessary to become who they want to be. 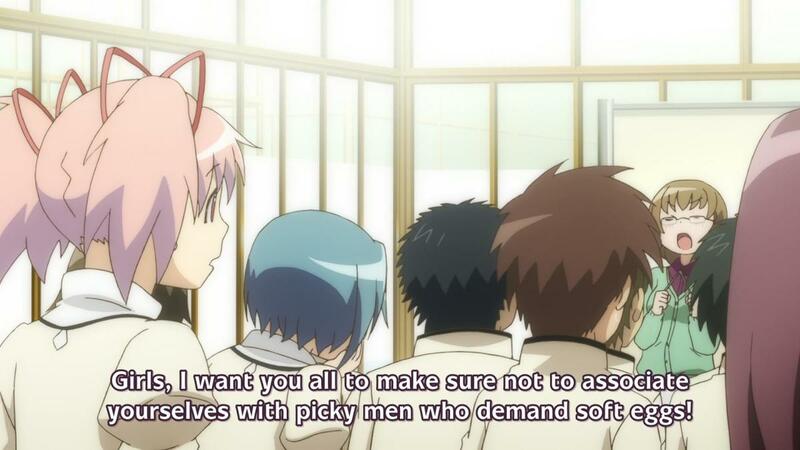 In the show, Madoka embodies this trait. She's something of a passive character, who listens to the perspectives of others, without ever really forming her own strong opinions. This exemplifies Locke's idea that humans start out innocent, whereas his rival Hobbes believed humans started out with a propensity for selfishness and violence. In utilitarianism, the basic idea is that morality should result in the maximization of happiness and the minimization of pain. Emphasis is placed on society, and not the individual. Therefore, this concept has been criticized because it may be possible in some situations that inflicting suffering on one person or a group of people might increase the happiness or minimize the unhappiness of the community as a whole. For example, waterboarding a terrorist could be justified by this ethical guideline, if doing so revealed information that would save lives. It is associated primarily with the philosophers John Stuart Mill and Jeremy Bentham. Like utilitarian thinkers, Kyubey is (if you believe he is speaking truthfully) primarily interested in the total sum utility of the universe, their collective goal being to minimize risk to the universe and to bring their idea of happiness to sentient life forms. 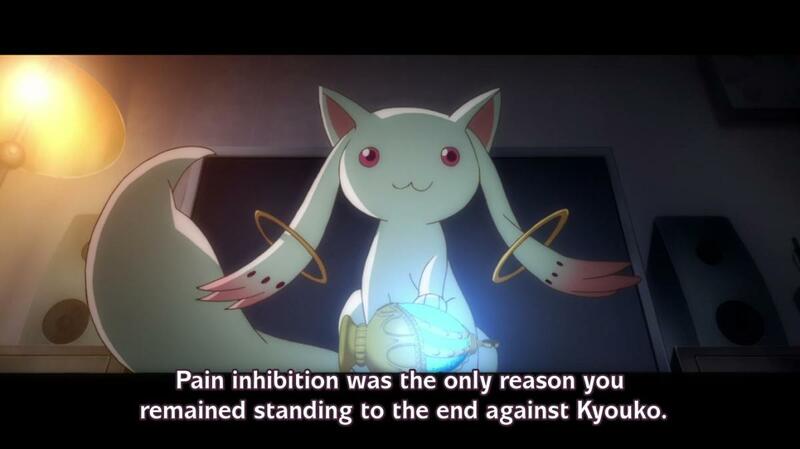 In Kyubey's point of view, he couldn't imagine why you would not want to be a magical girl; you gain a burst of happiness when your wish is granted, but more importantly, you're minimizing your own physical pain and insecurity by taking on the soul gem and helping prevent the death of the entire universe. He doesn't understand why the magical girls wouldn't welcome transition from magical girl to witch as part of one of many transitions in nature that are necessary for the survival of the whole, like a caterpillar becoming a butterfly. From a human perspective, Kyubey is creating a nightmarish state of slavery, but from their perspective, they're creating the only possible state of optimal outcomes for all of the universe (whereas humans are mostly just thinking about themselves). This problem has to do with the concepts of mind vs. body, are they separate or one? Some have argued for dualism, primarily Rene Descartes. He conceptualized people as "thinking machines", material bodies endowed with a soul that was separate from matter that gave rise to higher consciousness. Most religions believe in a spirit or soul that is separate from the physical organ of the brain. It seems that the highly advanced levels of consciousness possible in humans is mysterious and hard to explain by natural phenomenology alone. But, on the other hand, monists argue that mind and matter are not separate substances or identities, and that either everything is really material, or less popularly, that everything is mental (because we only ever experience anything through our mind processing sensory information). For one, damage to certain parts of the brain causes profound changes in a person's "soul", for example, their personality might be changed. In Madoka, this is explored through the concept of soul gems. 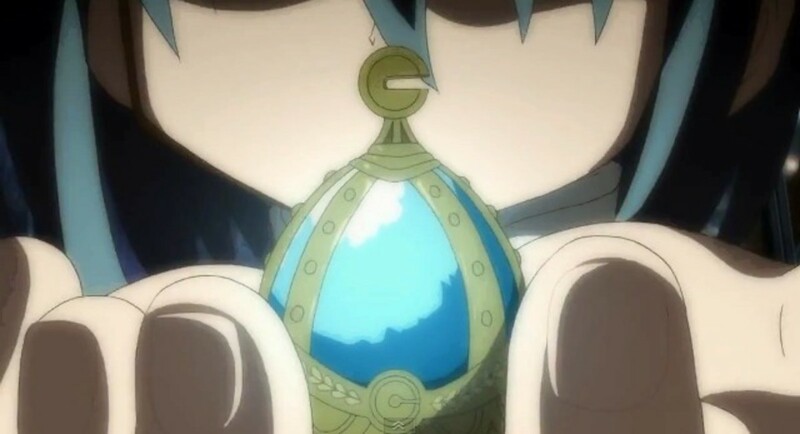 When a girl agrees to make a contract with Kyubey and become a magical girl, she's given a soul gem. She is told that this is the source of her new power. 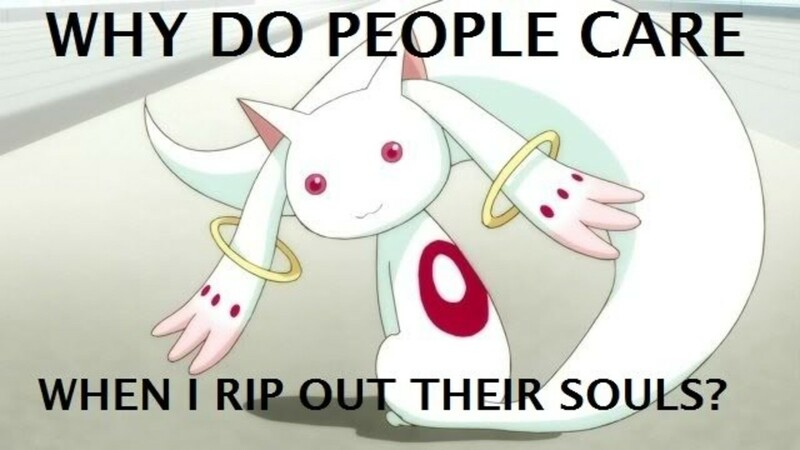 What Kyubey usually doesn't tell them is that their souls are literally put into those soul gems. To Kyubey, this is just to make them better at fighting (remember Kyubey is a utilitarian). But, to the girls who do uncover this truth, it's like losing one's humanity and having their soul trapped forever. This also relates to the Faustian references in the show (the concept of selling one's soul to the devil). Pragmatism is the belief that one should value the material or real-world consequences of their actions above all else. In politics, this often is used to mean diplomacy based on practical considerations over ideological concerns. For example, a democracy and an authoritarian regime might end up cooperating for a common shared interest, such as trade or security. In psychology, pragmatic thinking is used in the behaviorist perspective, which favors studying behaviors or actions, which can be measured and observed, over studying things like the unconscious, desire, mind, memory, and dreams, which don't lend themselves as directly to observation and study. Machiavelli was an Italian writer who, in a treatise called The Prince, espoused pragmatic viewpoints with regards to politics. In the Machiavellian framework, the state is a tool the leader of the state uses for their own ends. Similarly, Kyoko sees the power of a magical girl the same way, going as far as to say that being a magical girl excuses stealing food. Similarly, Machiavelli was often criticized for excusing abuses of power on the part of lords or royalty. 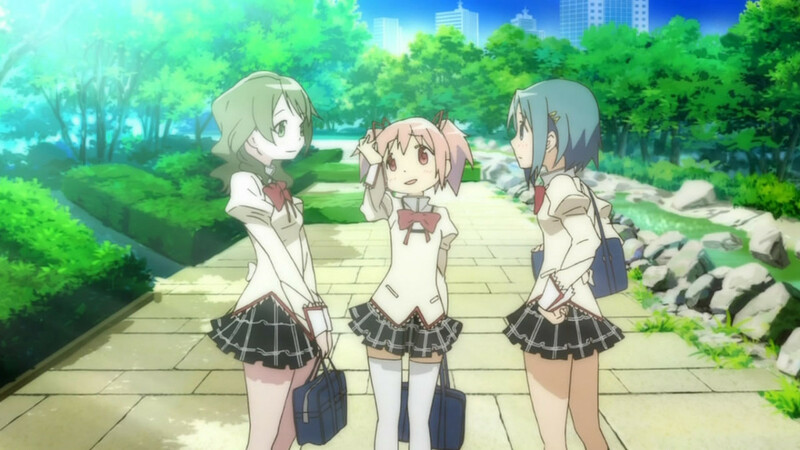 In Kyoko's perspective in Madoka, pragmatism plays a key role in her beliefs about what a magical girl should do and be. This is exemplified by her suggestion that Sayaka, instead of being altruistic and wishing for Kyousuke to recover the use of his hand, should have secured his dependence on her to get what she truly wanted, which was for Kyousuke to go out with her. Her viewpoint, informed by some very tragic personal experiences, leads her to believe that wishes and the power of being a magical girl should be used for selfish benefits, and that that is the only way to find true happiness. In many philosophies, the good of an imagined whole or society is believed to trump the concerns or desires of any particular individual within that group. Confucius talked about how ruling hierarchies created harmony, Hobbes believed in a similar notion of the role of royalty for the maintenance of peace and order in society, and Plato believed that the ideal city-state, or utopia, would be governed by a benevolent philosopher-king. However, the 20th century saw the rise of fascist totalitarian states where "government knows best" became a much less acceptable assumption, after the rise and fall of people like Hitler, Stalin, and Mao. Ayn Rand was a controversial writer and philosopher who pioneered the philosophy of Objectivism, which has been very influential on the right wing, in a kind of moral and philosophical battle with socialism and communism. Thus, in the latter half of the 20th century, much more philosophy and writing is focused on individual rights, while the battle still continues against collectivism as espoused by Marxist thinkers. This struggle is seen with the issues raised by Kyubey and the idea of becoming a magical girl. 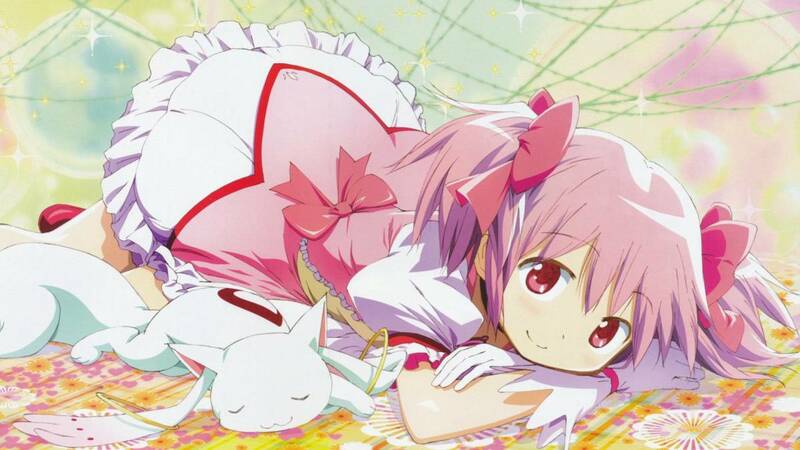 To Kyubey, no single human being's life matters, as they're all seen as interchangeable "cattle" being "farmed". The totality of existence is what motivates Kyubey, acting to save the entire universe. Kyubey itself is a collective life form with a collective mind; this is demonstrated when Homura kills one Kyubey life form and another takes its place immediately. As such, their biggest problem when it comes to understanding humans and human morality is our diversity and individuality. It baffles them to watch magical girls fight and disagree with each other, because the Kyubey do not have individual identities, personalities, goals, or even separate thoughts. 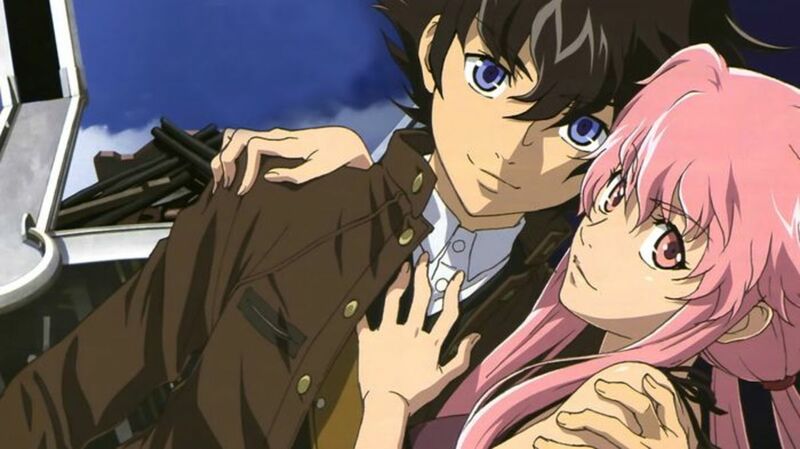 Thus, the main conflict in the show resembles the real-world struggle between collectivist and individualist philosophies and politics. Like I said before, Kyubey believes that a magical girl becoming a witch is just as much a part of nature as a caterpillar becoming a butterfly. He tells Madoka, "Do you feel sorry for cattle? ", meaning that he clearly believes that his species is superior to, and therefore right in controlling or manipulating, humans. Similarly, Kyoko believes that because magical girls are stronger than regular people and can do things regular people can't, might makes right. This concept was espoused in the form of social Darwinism. Charles Darwin posited that species originate from changes in other ancestral species that occur over many generations. In each generation, some members of the species will have certain traits and others will have others. Some traits will lend themselves better to survival and reproduction within that environment, and therefore, those will be the traits that get passed on. Therefore, the environment shapes the process of species formation by what Darwin termed natural selection. Social Darwinism, an idea popular in the late 19th and early 20th centuries, tried to apply this natural theory to human society. They argued for a notion that the fittest people naturally rose to the top, and that both humans and nature were geared on an inevitable course toward progress, which they incorrectly conflated with evolution (which in nature means something closer to 'change' or 'adaptation' than 'progress', which implies that the change is for the better). Herbert Spencer, a major philosopher in this movement, argued that competition resulted in the best outcomes economically and socially. For example, two competing bakeries being located near each other causes both of them to work harder to be open longer, make the best possible products, and charge more reasonable prices, resulting in better service to the customer. Similarly, we see a lot of competition in Madoka's world. 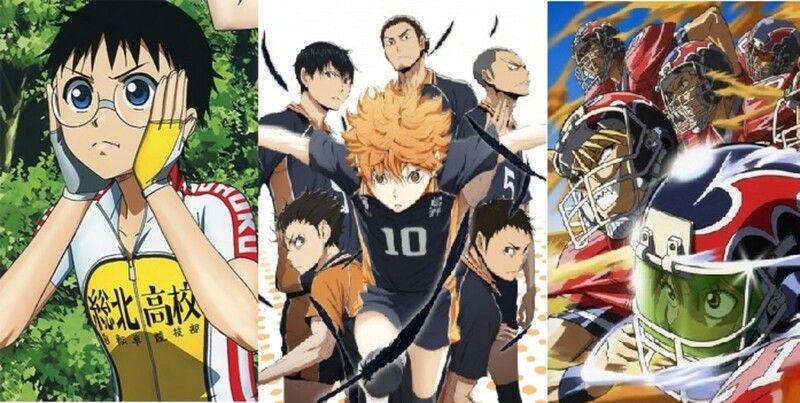 Magical girls tend to, as a rule, see each other as competition rather than allies or friends. This is in stark contrast with the Power of Friendship seen in typical magical girl shows. Perhaps this competitive nature is even encouraged by Kyubey, because magical girls working together with supportive friendships are less likely to achieve his desired result (becoming a witch, being defeated by magical girls, and being consumed for their energy). But since the whole thing is run by Kyubey the pragmatist, competition between magical girls is a plus, helping him achieve his desired goals. 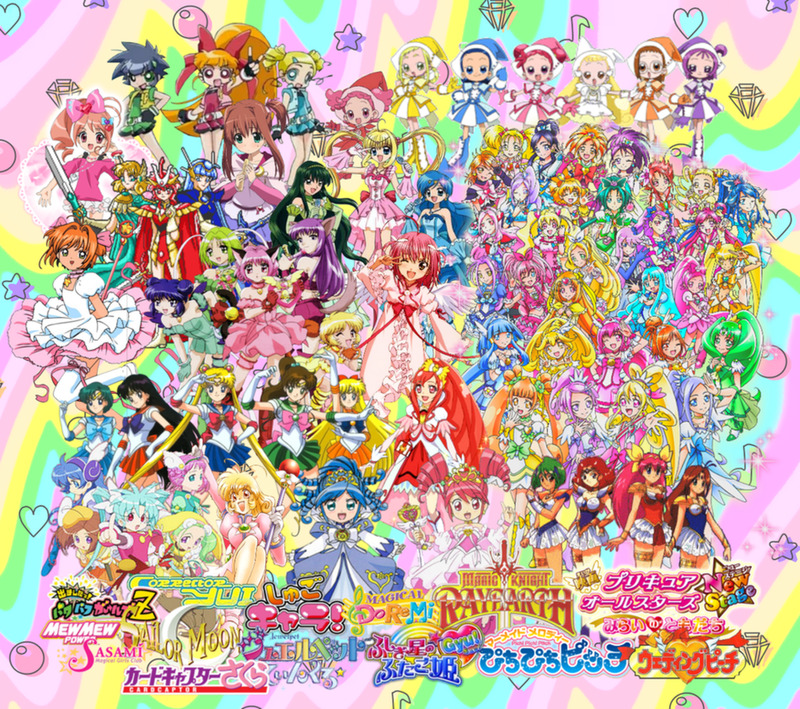 Magical girls of the world, unite! The main exception to this belief in competition is Mami. 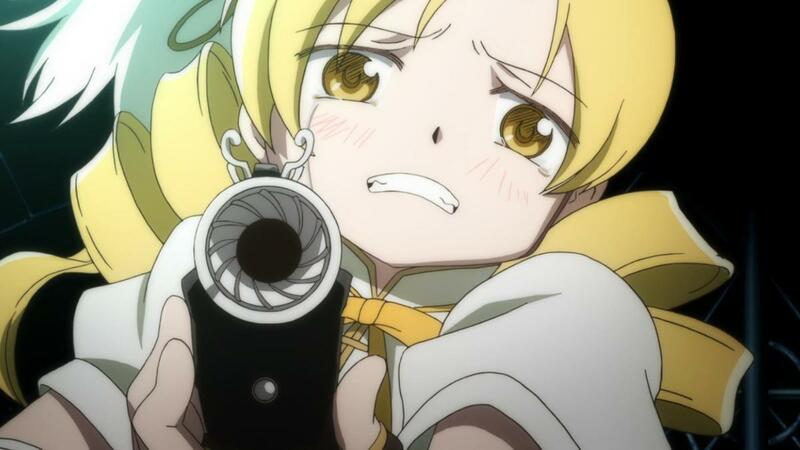 Mami firmly believes magical girls should work together as a team. This is why she initially doesn't trust Homura at first (in the beginning of the series, not in the first timeline), because Homura is sneaky and working toward her own individual ends. 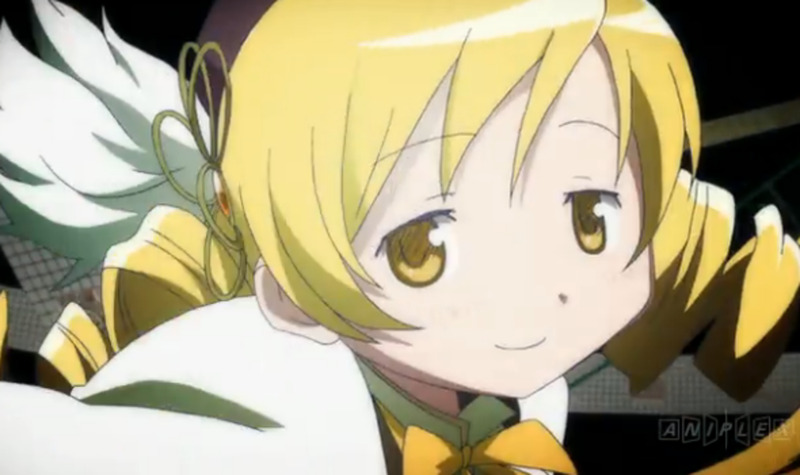 Mami sees herself as this "team mom" archetype we see in other animes. Because she lost her own family, she has a maternal instinct towards the newbies, Madoka, Sayaka, and even Homura (in Homura's original timeline). This contrast makes her a foil for Kyoko, who, as we've discussed before, believes all magical girls should go their own way, creating their own morality. Solidarity is the idea that certain groups of people have reasons to unite for a common cause. Mami believes in solidarity not just among magical girls, which arises because they have similar traits and goals, but for all of humanity, which is why she encourages Sayaka and Madoka to become magical girls themselves. She sees that witches cause people a lot of pain and suffering, and she sees it as her mission in life to fight witches in order to end that suffering. Altruism is defined by Wikipedia as the principle or practice of concern for the welfare of others. In biology, it is defined as an organism acting in a way that puts itself at risk or expends its resources for the benefit of another, whether it be for the benefit of a family member or simply another member of the same species (or more rarely, for a member of a different species). Psychological egoism is an idea in psychology that holds that pure altruism is probably not possible or likely to occur with human psychology, that all actions are motivated by some kind of personal gain. In the show, Kyoko espouses this by claiming that all wishes, even those claiming to be for the sake of others, are really to benefit oneself. Psychological egoism is demonstrated by the tragedy that is Sayaka's story. Sayaka is Madoka's best friend, who decides to become a magical girl because she wants to fight for good, for the protection of others (showing her altruistic mindset). For her, becoming a magical girl is her true wish, but then the problem for her is deciding what she wants to wish for. She's been visiting a boy in her class in the hospital that she likes, but his problem is that his hand is injured in such a way that he can never play violin again. 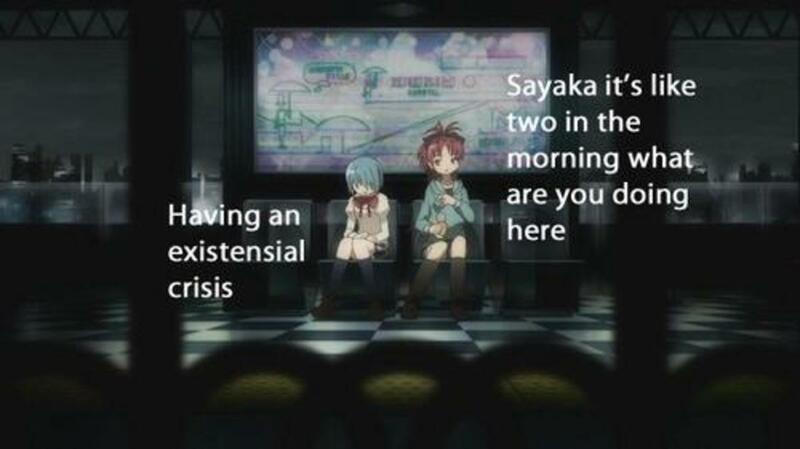 Sayaka uses her wish to heal him. Then, her friend Hitomi asks Sayaka's permission to date that boy, even though Sayaka likes him. Sayaka says yes, even though she really doesn't want to, because she again is showing an altruistic mindset. The problem with altruism, illustrated by Sayaka's story, is shown by the heartache and despair it causes her, causing her to become a witch very shortly after becoming a magical girl. It's showing that altruism, while noble, is not all that sustainable, and that you have to think of yourself and put your own needs first sometimes. Altruism is often sold to us as a key to happiness, but oftentimes it can lead to us making great personal sacrifices that take an emotional toll on us. 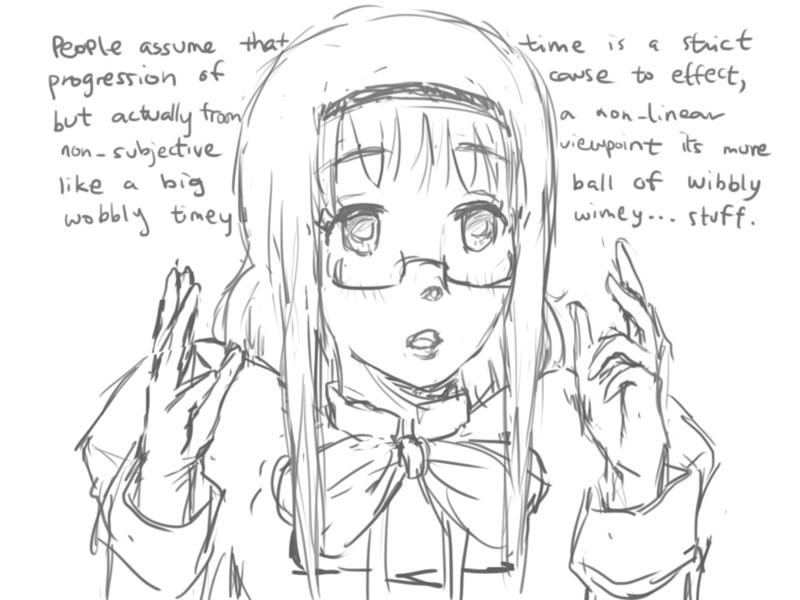 Sayaka illustrates many problems and failures of altruistic thinking. 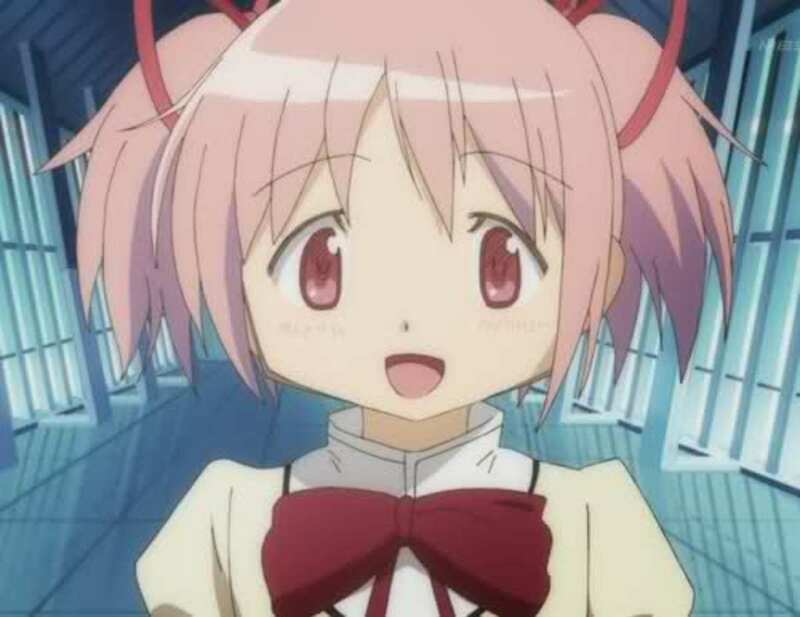 The problems uniquely associated with womanhood are brought up frequently in Puella Magi Madoka Magica. Egg, seed, and fertility motifs are abundant, with Kyubey getting its name from the English word "Incubator". Madoka's parents are a reversal of traditional gender roles, with a nurturing house-husband for a father and a go-getter career woman for a mother. Junko encourages the passive Madoka to be more confident and assertive. In the beginning, we see Madoka's teacher, Kazuko Saotome, ranting and raving about her boyfriend being inconsiderate, instead of actually teaching (and the rant is about eggs, which are a feminine fertility symbol). The girls are often surrounded by "guilded cage" style scenery, and their school has a lot of glass, suggesting that the girls are exposed and vulnerable. Sayaka's story is also about feminism. It is, after all, choosing to give up her power, her wish, for a boy, only to see that boy continue to not return her affection, that sets her down a spiral of despair. Furthermore, we see misogyny play a big role in Sayaka losing faith in humanity. On the train, she overhears some nasty sexist comments, from a man believing he should dump his girlfriend, calling her worthless. She confronts them, but they just don't seem to care. It's upsetting to her then to think she was putting so much stock into the idea of saving humanity, only to have misogyny be something that causes her to give up on humanity. So imagine, you have a being that is more powerful than humanity, who conceals a lot of the truth about reality from people, who seems to be using humanity for its own ends, who is ambiguous as to whether they're good or evil, but claim to be good and to hold everyone's best interests at heart. Are we talking about Kyubey, or God? 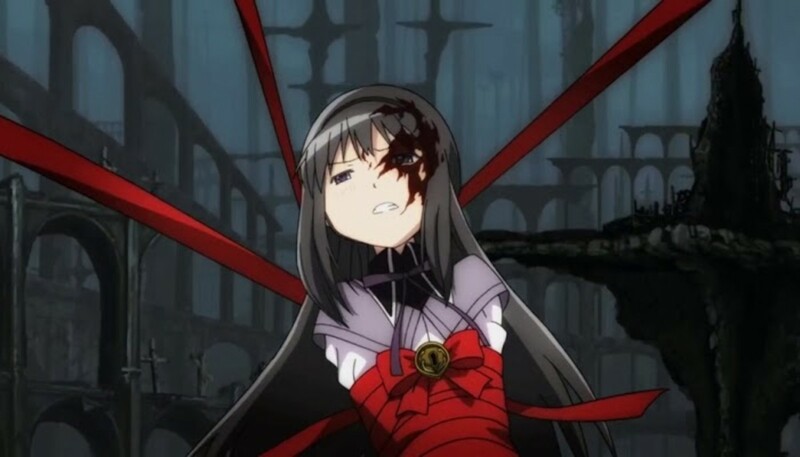 In the movie Rebellion, Homura becomes an anti-God figure almost as an inevitable reaction to Madoka becoming a God-like figure at the end of the anime. As the title implies, this is about rebellion; Madoka as God creates one new order, but for Homura to secure her own happiness within that new order, she must defy it. Anti-religiosity is also part of Kyoko's bitter cynicism against altruistic thinking. In her story, her father was a religious leader, and she believed in the heterodox messages he preached. 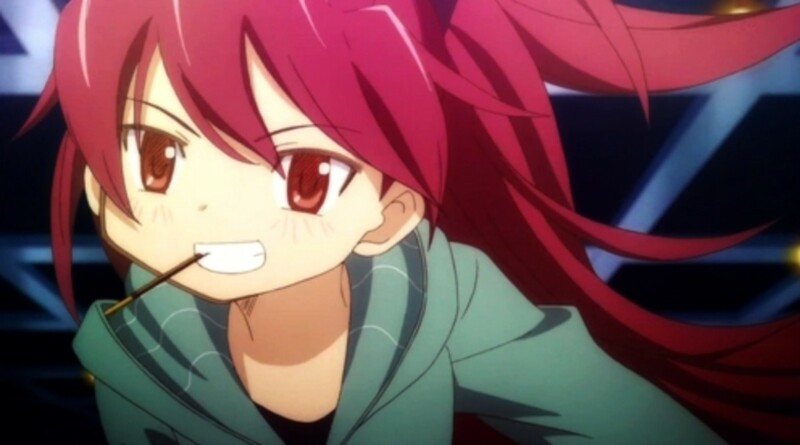 However, nobody really listened to him, so Kyoko corrected that with her wish. She saw herself as altruistic and seeking the greater good as a magical girl, much like many religious zealots do. But when her father found out about her being a magical girl, he turned against her, accusing her of witchcraft. 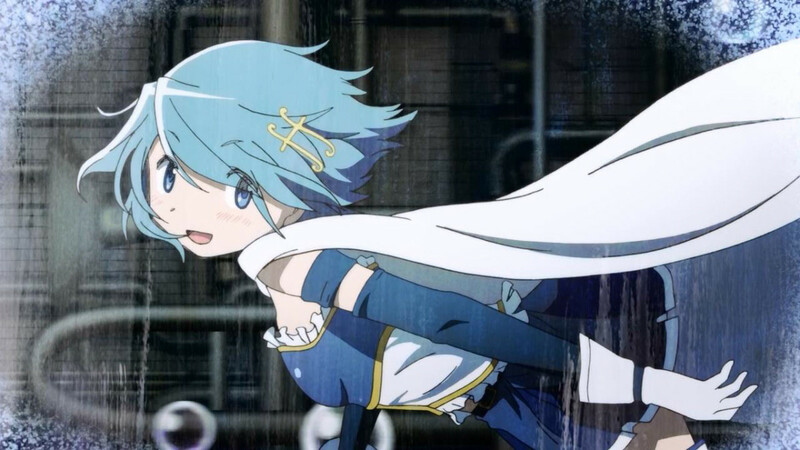 Like with Sayaka, the tragic events that ensued serve as a kind of warning against altruistic thinking. But also, they can be an allegory for problems associated with religion and Christian (and some other religions') missionary thinking. Kyoko's father could be seen as representing God, and Kyoko had a desire in her childhood to do right and serve God. But being a magical girl could be seen as the kind of sorcery that was taboo in the Bible. Therefore, it could be not only that she had this conflict with her father, but that being a magical girl led her into conflict with the beliefs she had once held. It raised an ethical question, was being a magical girl witchcraft? Was it forbidden by God? Kyoko believed it was good to be a magical girl, but later, thinking back, she says "my wish destroyed my family". Similarly, this could be a statement about how religions in general can cause family strife and disharmony, if members of the family come into religious conflict with one another. Existentialism is a lot of ideas and is very complicated, but generally it talks about the issues associated with how humans create meaning in their lives given life's apparent absence of meaning. The philosopher Kierkegaard said that to create meaning, one had to live authentically, rather than allow others to make their decisions for them. John Paul Sartre, a big name in existentialism, argued that no one could make meaningful life decisions for an individual better than they themselves could. Associated with existentialism is the idea of the absurd,the sometimes painful realization of the lack of meaning and order in the universe. The conflict with the absurd leads to existential despair. Wikipedia says, "Despair, in existentialism, is generally defined as a loss of hope. More specifically, it is a loss of hope in reaction to a breakdown in one or more of the defining qualities of one's self or identity. If a person is invested in being a particular thing, such as a bus driver or an upstanding citizen, and then finds his being-thing compromised, he would normally be found in state of despair — a hopeless state." 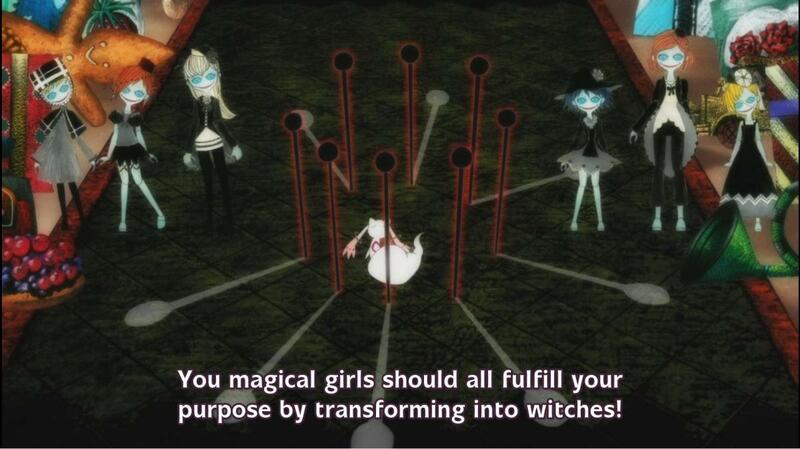 This hopeless state in Puella Magi Madoka Magica is what causes magical girls to turn into witches. The Ubermensch: The idea of someone with "master morality" who would live for themselves alone, without being fettered by the shackles of traditional mores. 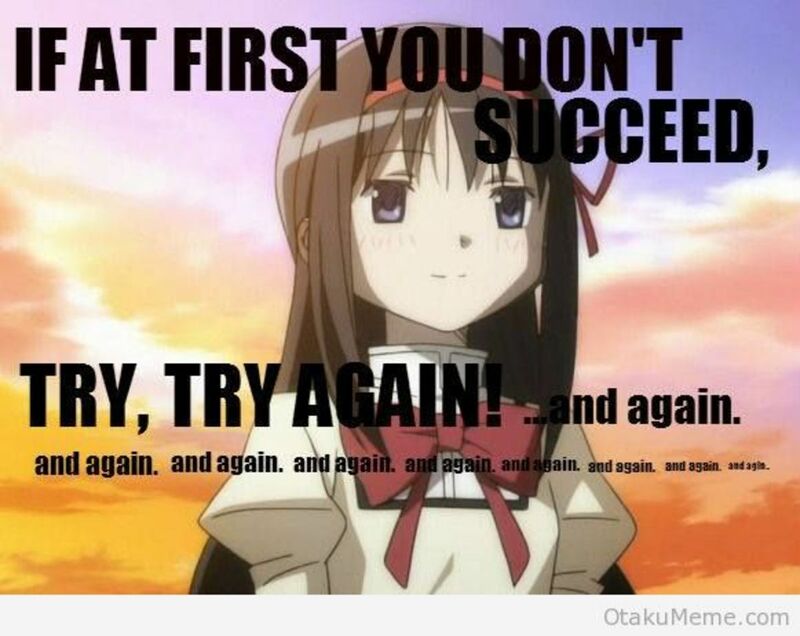 This could describe Kyoko, or possibly Homura in the end of Rebellion. Eternal recurrence: Nietzsche's thought experiment that posits someone re-living their lives infinitely. The idea is that someone would learn the true path they should take in life by contemplating that which they would not regret anything that they would have to relive. With Homura, you see her reliving the same month several times, but making constant changes to improve herself in order to live without regret or despair at her own weakness. This eternal recurrence is supposed to result in the concept of love of one's fate, or amor fati. This is exemplified by the Nietzsche quote (which may as well be said by Homura in the end of Rebellion): I want to learn more and more to see as beautiful what is necessary in things; then I shall be one of those who make things beautiful. Amor fati: let that be my love henceforth! The death of God: for Nietzsche, this meant not that literally God had existed and then died, but that modernity created a lack of need for God. This can be shown in the modern aesthetic look of the show, perhaps hinting that this is now a time when Kyubey, the all-powerful alien race who preys on humans, is going to be "killed" and made similarly obsolete by humans. Determinism vs. Free Will is a very important point of contention among philosophers. Some assert that only free will exists and that humans make true choices, others assert that our illusory choices are determined by causality or by God's plan, and still others say that perhaps free will and determinism are compatible concepts (that they can both be true to some extent). However, the possibility of time travel opens up new doors in this argument. For example, if all events are determined by causality, how then could it be possible to go back in time and change the past? If humans have free will, does going back in time and changing things change or interfere with free will? Is it immoral to go back in time and change bad things in history, for the very reason that it does not give others a right to free will? There are no easy answers to time travel paradoxes, but it is interesting to think about them. 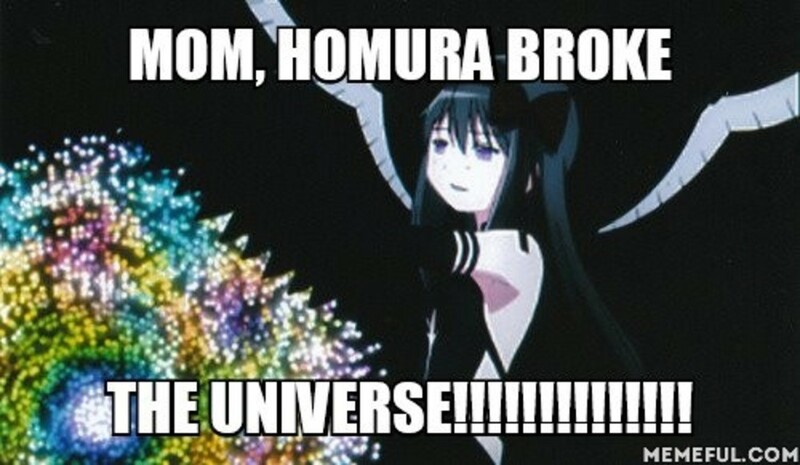 Homura breaks a system that appears deterministic (wherein all magical girls always inevitably turn into witches over time). In defeating it, she is championing free will and liberating humanity. While there are a lot of philosophical ideas in Puella Magi Madoka Magica, there is a kind of a problem with the pacing of the show, in that sometimes, these things can flash by from one scene to the next without much pause for reflection on the part of the audience. 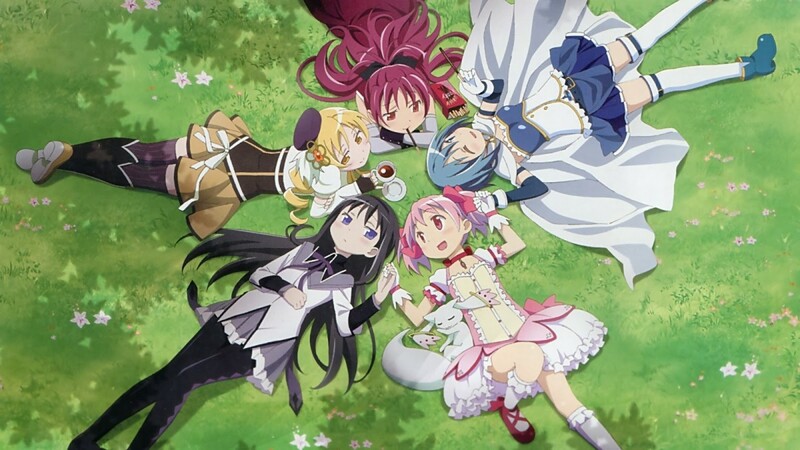 However, Puella Magi Madoka Magica is a rare show in that it manages to be so layered and deep while still being an entertaining show, unlike other philosophically noteworthy anime, which are usually philosophical at some expense to action and excitement. 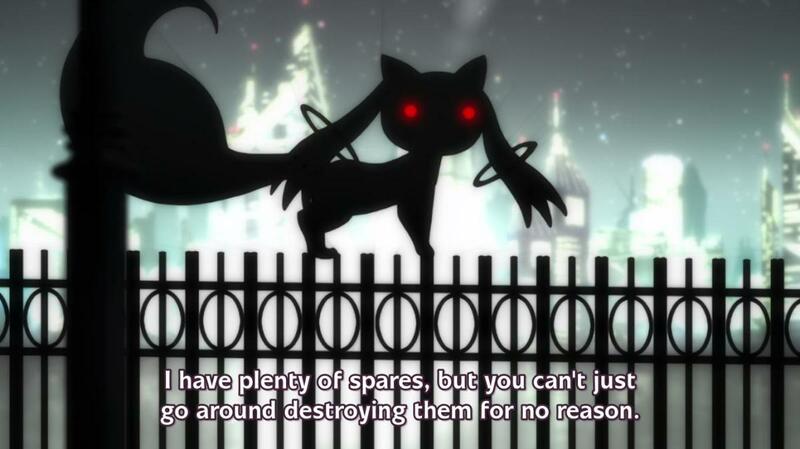 Which PMMM character has a morality closest to your own? That's also an interesting aspect of the show. What Madoka's mom tells her is (paraphrasing) that she's the kind of nice, innocent type of girl, but her problem is that because she's so nice, she plays it safe all the time and is afraid to take chances. So I interpret that lesson as not so much that a bad thing can serve a greater good, but that to learn good from bad at all you can't be afraid to mess up. She's telling Madoka to take more risks, to have more courage, because Madoka is a bit too timid. What about the concept of doing a wrong for the right? In one of the episodes where Madoka’s mother teaches her to do something wrong for the sake of her friend. Or if someone can’t be saved, then end his/her life quickly.